Ok, so putting aside the cost and dubious health benefits, I know you are all concerned with the environmental impact of this fad drink. After a little bit of research, I discovered that the production of coconuts is quite the opposite - it requires little chemical additions, the root structure reduces erosion, and can actually add to soil fertility. A Mother Jones' article notes that the largest portion of coconut water's environmental footprint comes from the fact that it must travel so far to reach your grocery cart. Still small in scale, if the demand for this beverage continues to rise so precipitously, its benign environmental state may not remain so. No conclusions, only the question of where to stand on the issue of the coconut water craze. Interesting post! 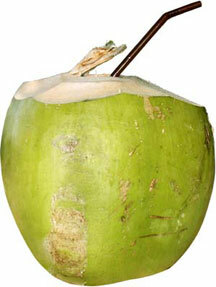 I got into coconut water when I worked long hours in a hot bakery - sweated for 10 hours a night! Not an athelete but I think it was worth it!